TheGunBlog.ca — Firearms Outlet Canada Inc., one of the country’s biggest independent gun stores, is selling about 4 million rounds of ammunition and other shooting gear in a “blowout” sale it said is the largest of its kind in Canada. The retailer will discount about 20 warehouse pallets of ammo, as well as boots, vests, cartridge magazines, hard and soft gun cases, clay throwers, metal targets and other shooting accessories. Some firearms will also be at reduced prices. Hunting is at the heart of Canadian heritage and culture and target shooting is one of the country’s safest and most-popular sports. More men and women have a firearm licence than play golf or hockey, and millions of unlicensed family and friends of all ages shoot under their supervision. 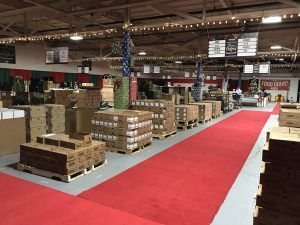 The shop collaborated with North Sylva Co., Canada’s biggest gun importer, and two other distributors to run the sale starting Dec. 1 at its store in Ajax, Ontario, about 45 km northeast of Toronto. Santa Claus will be at the store on Dec. 1 from 11 a.m. to 2 p.m., Pellegrino said. He said some of the steepest discounts are on surplus boots from a police SWAT contract, and a model of Ridge Footwear Air-Tac boots. Pellegrino also said he will start selling tickets in February for the Tactical & Competitive Shooting Sports Show (Taccom) he’s organizing next September at the International Centre near Toronto’s main airport. Firearms Outlet Canada says it will discount 4 million rounds of ammo and other shooting gear in a “blowout” sale. Update 28 Nov. at 10:15 Toronto time: Adds context on hunting and sport shooting in third paragraph.